On January 30, Con Edison submitted an electric rate case proposal to the New York Public Service Commission (PSC). In addition to supporting better service through an improved website and enhanced reliability, resiliency and security, the proposal includes a multi-year smart meter plan. Smart meters are an integral part of what is known as the smart grid. The term ‘smart grid’ refers to the modernization of the transmission and distribution components of the electric grid with enhanced monitoring and control capabilities, enabling the efficient and reliable two-way flow of electricity and information. So what are smart meters? 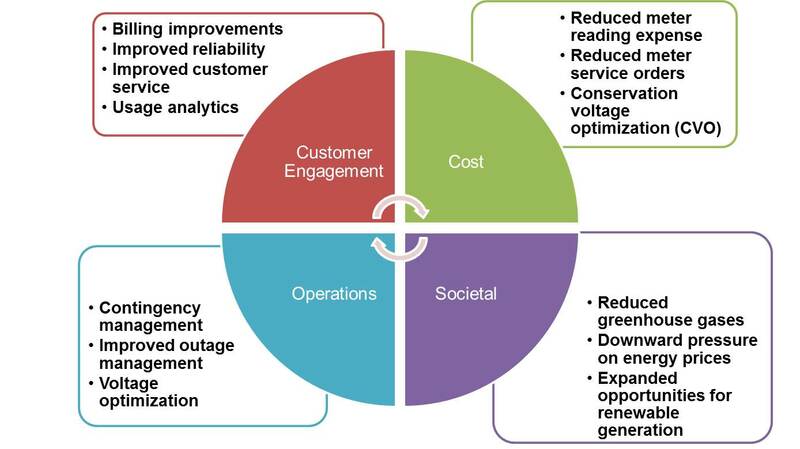 Smart meters are electronic measurement devices that can not only provide customers with detailed energy usage information, but can also facilitate utility operations and customer services. Over 40 percent of U.S. households now have smart meters. Automated Meter Reading (AMR) systems are capable of one-way communication, from the meter to the utility. In some cases the AMR meters do not include a permanent communications system. Advanced Meter Infrastructure (AMI) includes a robust communications system that provides for two-way communications. Such systems can facilitate more frequent near real-time data communications and can play a critical role in shaping the future electric grid as new energy services and renewable technologies are being integrated. Smart meter technology may also help the PSC implement the Reforming the Energy Vision (REV) proceeding by engaging customers and giving them a way to view and manage their energy usage, and reduce greenhouse gas emissions. The technology will also allow utilities to gain better information about customer response to energy prices, and provide the company with real-time voltage and load information at each metered service point, which can help the utility to manage future system costs’. The enhanced monitoring and control functionality associated with AMI may also reduce the occurrence and duration of outages at critical facilities. As smart meter technology has evolved over the past 15 years, it has come with its share of consumer concerns. Chief among these are radio frequency (RF) and security. Fortunately, there is a great deal of research and experience in the industry on these topics. For example, studies show the RF exposures of smart meters are actually lower compared to other common sources in the home and operate significantly below Federal Communications Commission (FCC) requirements. Nevertheless, Con Edison is currently seeking approval from the PSC to allow qualifying residential customers the ability to opt-out of having a smart meter at their home. To better protect the security of consumer information, government and industry have undertaken a number of initiatives to address potential risks. For example, there are comprehensive national cyber security compliance standards for utilities and vendors in order to address remote access, authentication, encryption, and privacy of customer-specific data and information. Con Edison’s customers stand to benefit from the experiences of many utilities that have already installed AMI technology. The company will take advantage of this knowledge by benchmarking with other utilities and vendors that have deployed similar projects in urban areas. Throughout 2015, Con Edison will implement a formal project planning phase to develop its detailed implementation plan for AMI system deployment. The January rate case filing seeks the funding necessary to support AMI system rollout beginning in 2016. Last week close to 200 employees gathered at the Rubin Museum of Art to celebrate their volunteer achievements over the last year. Through Con Edison’s Power of Giving volunteer program, employees are able to give back to their communities and strengthen the organizations serving neighborhoods across the city and Westchester. Watch the video. The year’s volunteer reception featured Monica Singleton, an Analyst in Cost & Project Accounting. Monica spoke to the group about her own personal volunteer experience, why volunteering was important to her and challenged employee volunteers to do more in 2015. “Every time we volunteer, we interact with members of the community and communicate the company’s initiatives for helping others through our encounters. We should all be proud of the work we’ve accomplished and the enormous impact our actions have had on the citizens who live in the communities in which we serve” Monica said. In 2014, 575 Con Edison employees volunteered over 7,300 hours to our communities throughout our service territory through the company’s Volunteer Program. On any given weekend or after work hours, Con Edison employees can be found planting trees, cleaning parks, painting schools or mentoring students. All of this work helps strengthen the ties to our communities, and helps make our neighborhoods better places to live. There is no question that the work we do makes a difference to improve the lives of the people we serve. But it also feels good, too. So check out the video about our volunteer program and come out and come out and volunteer with us at a future event. Con Edison’s commitment to diversity can be seen in many of the strategic partnerships the company supports throughout our community. The Young Women’s Leadership Network Schools (TYWLS) is an example of a partnership that exemplifies our corporate goals to further STEM (science, technology, engineering, and math) education in the community. TYWLS are privately supported 6th – 12th grade public secondary schools that promote high-quality student learning opportunities in and out of school. The schools provide an all-girls educational choice for predominantly low-income students who will be the first in their families to attend college. Since 2003 Con Edison has supported the Young Women’s Leadership Network (YWLN) with sponsorships for their Marine and Earth Science Enrichment Program (MESEP). Entering its 13th year, MESEP provides students with what is often their first experience in the natural environment. The program goal is to deepen classroom learning, increase science proficiency and encourage young women's further pursuit of STEM studies. The program is delivered in collaboration with nonprofit and post-secondary partners that bring in-school, out-of-school, and extended-year science activities to 540 inner-city girls in the 6th-12th grades at the five TYWLS network schools. Exposure to STEM careers and female role models deepen girls' interest in science and understanding of its real-world application. Last year, a group of Con Edison women presented at the YWLN’s Cool Women Hot Jobs. The women came together from Public Affairs and Steam to help expose the students to STEM careers available at Con Edison and deepen the girls’ interest in science and understanding of its real-world application. If you are interested in participating in this year’s program, please drop us a line at powerofgiving@coned.com. Volunteers will be asked to speak in small groups about your daily activities, responsibilities and challenges, the education and skills needed to succeed in your field, your career path, and interesting aspects about your profession.